A healthy vegan dinner recipe made of Basmati Rice and Wild rice. 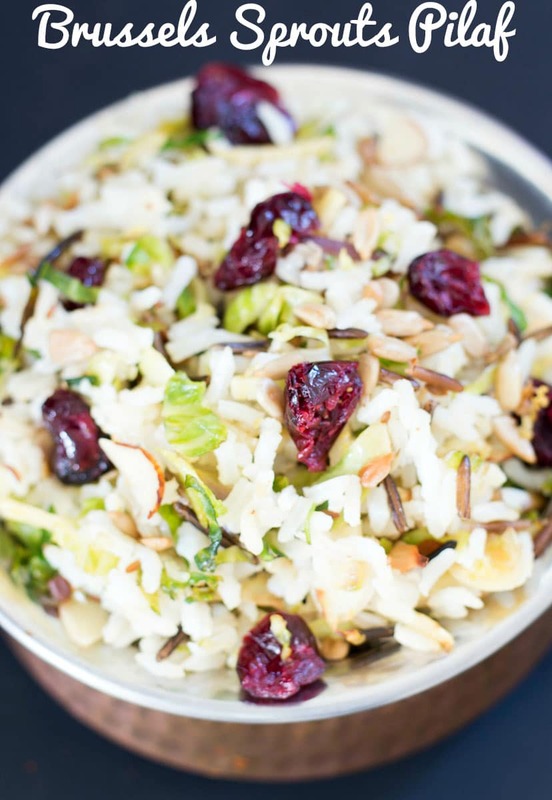 The rice pilaf recipe has shredded Brussels sprouts and sunflower seeds. Rice Pilaf made with wild rice, basmati rice, shredded Brussels sprouts and sunflower seeds. 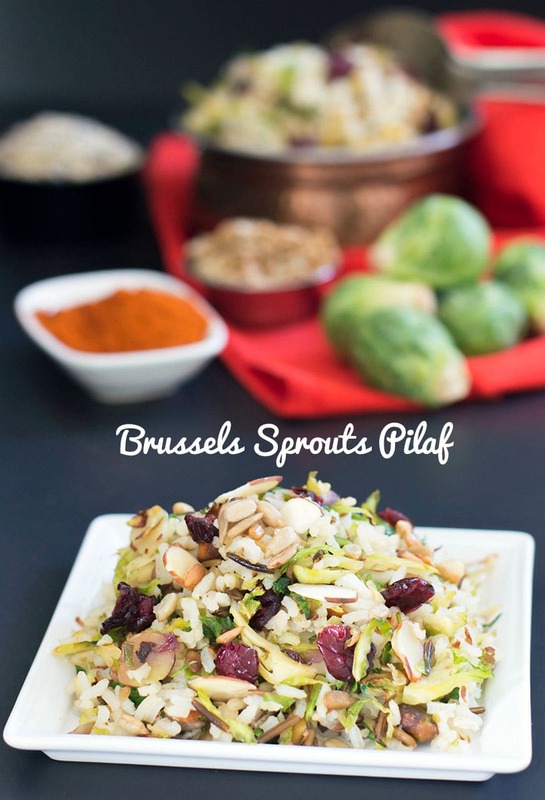 This pilaf recipe will make even the biggest Brussels sprouts hater into a fan! 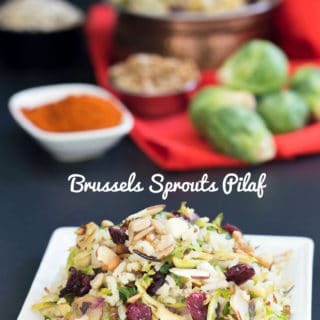 The basmati rice mixed with cranberries make the Brussels sprouts taste like heaven! Honestly, I am a huge fan of Brussels sprouts and I think many of you are because you love my Mediterranean Brussels Sprouts Recipe. It really is a delicious vegetable when it is cooked right. Buttery Brussels sprouts with extra black pepper are my huge weakness. If you like pilaf recipes, try my barley pilaf recipe today. – The Brussels sprouts are the true fan of this recipe. They add flavor and additional nutrition to this recipe. The best way to add them to this recipe is to shred them. – It is easy to take the easy way out by placing the Brussels sprouts into a processor and shredding them. The results will be an unevenly shredded mess. – Just like everything else in life, if you want something done right, do it yourself. Cut the the Brussels sprouts into half, lengthwise. – Then cut them into long and thin strips starting from the edge, working inwards. I like to keep them a little thick so they don’t burn out when cooked. Not surprisingly, I have included dried cranberries in this recipe. My pantry is filled with them because I have a friends with a very strange sense of humor. They add a natural and healthy sweetness to this recipe which means that I don’t have to add any sugars to the recipe. What is your favorite way to use wild rice? 2) Take about 15 Brussels sprouts and cut them in half lengthwise. Cut the halved Brussels sprouts into long shreds. Keep them a little thick to prevent them from burning during the cooking process. 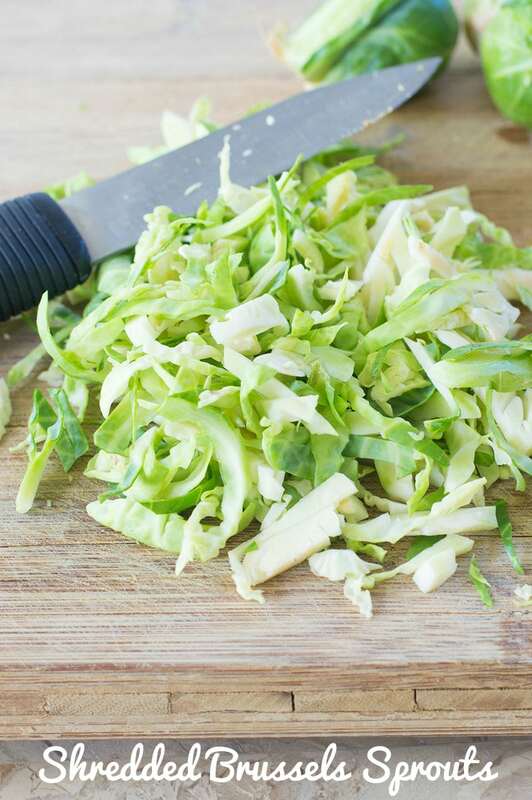 After shredding them, you will have about 3 cups worth of shredded Brussels sprouts. 3) Take a quarter of a red onion and cut it into julienne style. Do the same for 2 cloves of garlic. 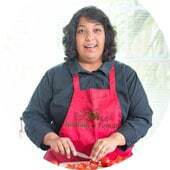 4 ) In a pan that has a thick bottom, add 2 tsp of vegetable oil. Add the onions and garlic to it. Stir gently to make sure that the onions don’t burn. 9) Add 1/2 tsp of cayenne pepper, 2 Tbsp of sliced almonds, 2 Tbsp of sunflower seeds and 1 tsp of whole pistachios. 10) Add 1 tsp of freshly squeezed lime juice, 1 tsp of salt, 1/2 tsp of balsamic vinegar and 1/4 tsp of turmeric. Turmeric is optional, but, it will add a little color to the recipe. Serve this rice pilaf as a meal by itself or as a side meal. A healthy vegan dinner recipe made of Basmati Rice and Wild rice. Take about 15 Brussels sprouts and cut them in half lengthwise. I couldn’t stand it and headed over to find out about those cranberries, how fun! Gotta love friends with a great sense of humor! 😀 I love everything about this recipe. The crunch, crunch of all these goodies sounds just delicious. What a great meal! Thank you, Debra. The crunch is the best part of this recipe. I love how great the Brussels sprouts work in this recipe.